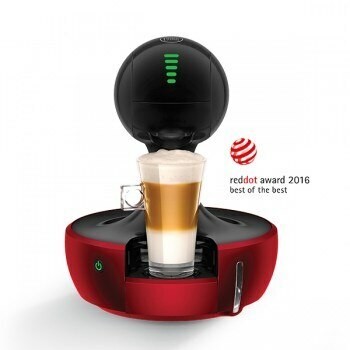 Inspired by a drop of coffee, the beautiful NESCAFÉ® Dolce Gusto® Drop automatic capsule coffee machine is a truly stylish piece for your kitchen. The Drop is a sleek 25cm (W) x 32cm (H) x 25cm (D). Create professional quality coffees with a thick velvety crema thanks to the machine’s high-pressure system (up to 15 bars). With our hermetically sealed capsules, which preserve coffee freshness, you’ll enjoy rich aromatic cups every time. This automatic machine is so easy to use: just slide in a capsule, customise your beverage size at the touch of a finger, and go. Or, if you want your coffee as easy as possible, follow the preparation suggestions on the capsule. A convenient eco-mode feature automatically switches off your NESCAFÉ® Dolce Gusto® Drop coffee machine after 5 minutes of inactivity, meaning this machine has an A rating in energy consumption. Start creating exquisite beverages right away with the free discovery box of six assorted capsules that comes with your Drop capsule coffee machine. With NESCAFÉ® Dolce Gusto® you can enjoy over 30 premium coffee creations, whether you like your coffee short or long, black or white. Enjoy a choice of bold Ristretto, intense Espresso, aromatic Lungo and full-bodied Grande, to frothy Cappuccino and smooth Latte Macchiato, or even hot chocolate, teas, and cold beverages.